It’s imperative for people to take time to feel emotions and work through them in order to maintain a balance in body, mind and spirit. Work-life balance has been a hot topic in recent months, but a balanced life is about much more than work, according to licensed clinical social worker Maggie Davis-Jelly. Davis-Jelly has extensive experience working as a psychotherapist, social worker and family mediator, teaching her patients that balance is key to emotional wellness. 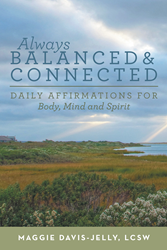 In Davis-Jelly’s new book, “Always Balanced and Connected,” she guides readers toward spiritual, mental, and physical awareness using uplifting daily affirmations to promote self-awareness and the idea of living a balanced life. Everyone faces pain and self-doubt from time to time, but we must learn to lean on others in times of need and be a helping hand to those who need it, according to the author. “It’s imperative for people to take time to feel emotions and work through them in order to maintain a balance in body, mind and spirit,” said Davis-Jelly. The author actively promotes this practice in her own life by participating in activities like yoga and martial arts. She also emphasizes the importance of thoughtful prayer and mindful meditation help renew the spirit and achieve a balanced sense of self. For more information, visit http://www.AlwaysBalancedandConnected.com. Maggie Davis-Jelly runs a private practice as a Licensed Clinical Social Worker in the New York/New Jersey metro area. She graduated from Ramapo College of New Jersey in 1985 and earned her graduate degree from Rutgers University in 1991. Maggie is an advocate for victims of domestic violence and volunteers for nonprofit organizations that raise awareness by speaking out against and lending support to empower survivors of domestic violence. She has been a student of martial arts since 1997. Maggie resides in Sussex County, New Jersey, and West Tisbury, Massachusetts.